Abies magnifica 'Mt. Si' is an irregular, upright, globose selection of California red fir with clumpy, random branching and dense, species-typical steely Blue foliage. With age, some apical dominance will develop by it would take a very long time before a plant would become conical or pyramidal. After 10 years of growth, a mature specimen will measure 3 feet (1 m) tall and wide, an annual growth rate of 3 to 4 inches (7.5 - 10 cm). This cultivar was named and introduced in the 1990s by Dave DeWire, former owner/proprietor of Mt. Si Nursery, North Bend, Washington. He received the original cuttings from an unknown individual who presumably found either a witch's broom or a natural dwarf mutation in the mountains of southern Oregon or northern California where the species is native. Abies magnifica 'Mt. 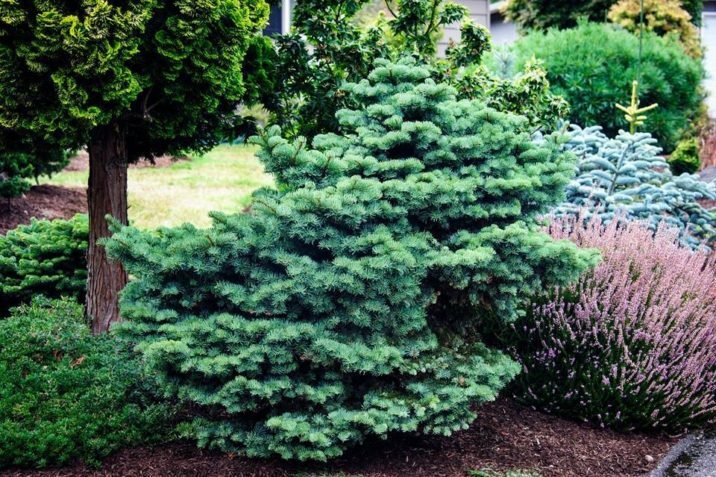 Si ?— a 15-year-old specimen in a private garden in Washington state.